smart retail solution Largest Kiosk Supplier in China: SZZT Electronics Co., Ltd.
SZZT’s comprehensive solution for smart retail uses mobile Internet technology to provide retailers with overall O2O operational ecology with machine interconnected cloud platform(TSP), combines and links POS terminals, online and offline management system of retail chains and banks with WeChat and Alipay, realizes O2O business operational mode, centralized management and digitization of inventory of retail chains and promotes management efficiency. In addition, the new modes of payment like WeChat and Alipay realize all-channel payment model, improve customers’ shopping experiences and enhance sales capability of offline stores through TSP’s analysis of data of different consumption to arrive the aims of predicting operation and precising marketing. Enhancing customers’ experience and increasing flow of people to achieve incremental sales. “Shuaishou shopkeeper” is based on TSP, which forms a set of solution for informatization of chain monopolized stores by integrating embedded terminal, mobile internet technology and terminal operation and maintenance service. This solution provides the one-stop informationalized service for chain retail enterprises. There is no need for merchants to additionally dispose software, hardware, internet and server. And there is no need to build the professional team for information management. 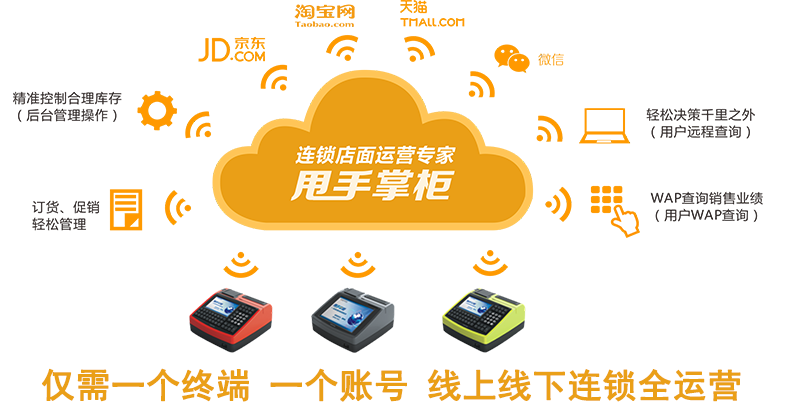 “Shuaishou shopkeeper” could achieve unified management of store information only by placing a wireless terminal with the function of cashier in the store. The executives could complete the work of all store management by logging in to the cloud management platform in different places.“Shuaishou shopkeeper” not only makes the chain enterprises achieve operational management of the store, but also achieves “O2O Seamless blend” and precision marketing by TSP.